Panasonic Corporation is celebrating its 100th anniversary with a host of activities to develop the brand in Vietnam. Located on the second floor of a building in Tran Thai Tong Street in Cau Giay district, Hanoi, Panasonic Risupia Vietnam is a communications space for Panasonic and its customers with free entry. The space consists of a showroom, where customers can sample new lifestyle ideas by experiencing Panasonic’s latest products and advanced technologies, and Risupia, where children can discover the beauty of mathematics hidden in nature and the wonder of science in everyday life. Eight years since opening in 2010, Panasonic Risupia Vietnam has welcomed more than 500,000 visitors, including nearly 400,000 school students to Risupia. Founded on March 7, 1918 by Mr. Konosuke Matsushita, the Panasonic Corporation has since followed its founder’s management philosophy of contributing to society and creating “a better life, a better world” through business activities that improve the lives of people around the world and further progress society. It began business in Vietnam nearly 50 years ago, aiming to contribute to the country’s society through activities ranging from research and development (R&D), manufacturing, and sales and distribution to corporate social responsibility. 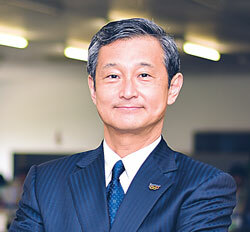 Panasonic has built a sustainably growing brand during its 50 years in Vietnam. Aiming to contribute to the country’s economic growth via business expansion, Panasonic’s brand commitment is to make a better life for Vietnamese people. 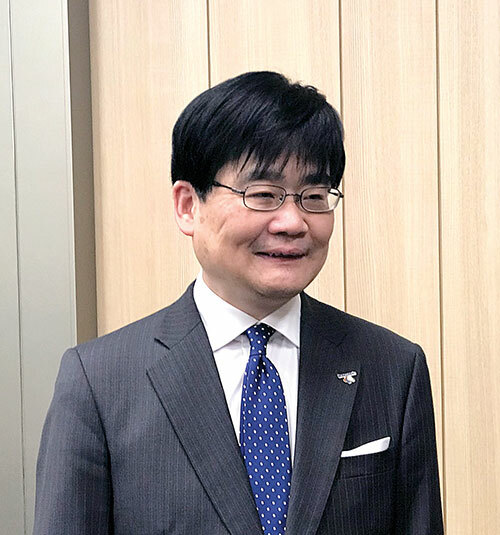 “Our main target is to contribute to the sustainable development of Vietnam and a better life for all Vietnamese people,” said Mr. Kazuhiro Matsushita, CEO of Panasonic Vietnam. 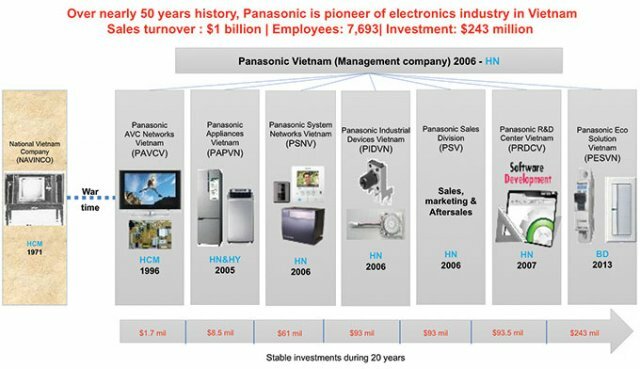 Panasonic has been a pioneer in Vietnam’s electronics industry, with total sales turnover of $1 billion, approximately 8,000 employees, and total investment of $243 million. Panasonic Vietnam comprises seven companies, five of which are manufacturing companies: Panasonic Industrial Devices Vietnam (PIDVN), Panasonic System Networks Vietnam (PSNV), Panasonic Appliances Vietnam (PAPVN), Panasonic AVC Networks Vietnam and Panasonic Eco Solutions Vietnam (PESVN), and the Panasonic Research & Development Center Vietnam (PRDCV). The company’s highlight products include appliances (air conditioners, refrigerators, washing machines, TVs, and small home appliances), eco-solutions (modular kitchens, air purifiers, solar photovoltaic modules, and wiring devices), connected solutions (projectors, PCs and tablets, in-flight entertainment systems, and integrated line control systems), and automotive and industrial systems (next-generation cockpit systems, EV relays, and lithium-ion batteries). In fiscal year 2017, it recorded growth of some 10 per cent in all business activities in Vietnam, in particular the appliance and eco solution business lines, which saw growth in excess of 20 per cent. As a brand built upon 100 years of reliability, Panasonic will continue to expand its business in different fields, invest in R&D, develop leading technologies, solutions and products, enhance customer services, and contribute to society through different educational and environmental projects in Vietnam. Last December marked a milestone for Panasonic in Vietnam, as PESVN opened an expanded wiring devices and circuit breakers factory in southern Binh Duong province. An additional factory was built with the aim of doubling Panasonic’s production capacity of wiring devices and circuit breakers in FY2020, which enhances its responsiveness to the rapid increase in demand for these products in Vietnam and elsewhere in Southeast Asia over recent years. Panasonic also wants to establish a presence as a pioneering business-to-business (B2B) solutions provider. “We are introducing various solutions for business, including solutions for housing, transport, air quality, security, LED lighting, and factories, etc., and in particular total developer solutions in the B2B field, to contribute to Vietnam’s prosperity,” Mr. Matsushita said. Panasonic Vietnam also expends continuous efforts in its corporate social responsibility (CSR) activities. As well as opening Panasonic Risupia Vietnam for young Vietnamese to enjoy, it has also introduced other educational and environmental programs such as the Panasonic Scholarship, Kid Witness News, the Panasonic Global Eco Learning Program, and Eco Relay. There is also the Solar Lantern Project, conducted globally as part of its 100th anniversary celebrations and aiming to donate 100,000 solar lanterns to areas with no electricity. The program has been held in provinces such as Dien Bien, Yen Bai, Thanh Hoa, Quang Nam and Quang Ngai in Vietnam, providing total of 2,832 lanterns. In order to continue the company’s contributions to the success of Vietnam’s economy, Panasonic needs ongoing support from the government to create a more favorable operating environment for foreign investors, especially in regard to administrative procedures and legal infrastructure. “We expect to receive cooperation from authorities in facilitating and recognizing our activities in education and the environment, so that we can contribute more to Vietnam in the future,” Mr. Matsushita said.